How do 5G small cells work and where will you see them? You might have heard of 5G, the newest mobile networking technology that's replacing 4G...but how does it work? You might know that a 5G network uses what’s called small cells, but what does that mean, and does this new technology change the conversation around cell phone radiation? The cell tower is an essential part of a 5G network. Like any network infrastructure, certain equipment is needed to relay information between devices, which is exactly why a 5G tower is needed for 5G networks. A 5G tower is different than a 4G tower both physically and functionally: more are needed to cover the same amount of space, they’re much smaller, and they transmit data on an entirely different part of the radio spectrum. What Are 5G Small Cells? A small cell in a 5G network is the base station that serves a critical role in the overall network. They're called “small cells” as opposed to "macrocells" used in 4G networks because they’re relatively smaller in size. Since 5G towers don’t require much power, they can be made relatively small. This is important not only for aesthetics but also for space efficiency — small cells support high frequency millimeter waves, which have limited range (more on why this is important below). A 5G cell tower is basically just a small box, like you see in the "5G" labeled image above. While this is how most 5G implementations will turn out, some companies are burying antennas under manhole covers to extend their mobile network through the streets. Despite their size, small cells are not weak. The tech inside these cells is what allows 5G to be so fast and support the growing number of devices requiring internet access. Inside a small cell is radio equipment necessary for transmitting data to and from connected devices. The antennas within the small cell are highly directional and use what's called beamforming to direct attention to very specific areas around the tower. These devices can also quickly adjust power usage based on the current load. This means when a radio is not in use, it will drop down into a lower power state in just a few milliseconds, and then re-adjust just as quickly when more power is needed. 5G small cells are fairly simple in design and can be installed in less than a few hours. This is very much unlike the beefier 4G towers that take much longer to install and get up and running. Of course, small cells also require a power source and backhaul to connect it to the carrier's 5G network, and eventually the internet. A carrier might choose a wired fiber connection or wireless microwave for that connection. 5G promises an extremely interconnected world where everything from smartwatches, vehicles, houses, and farms utilize the ultrafast speeds and low delays it offers. To accomplish this, and to do it well — with as little coverage gaps as possible — it’s required to have a huge number of 5G towers, particularly in areas that demand lots of traffic like big cities and business districts. Fortunately, since 5G cell towers are so small, they can be positioned in ordinary places like on light poles, the tops of buildings, and even street lights. This translates into less traditional looking towers but also potentially more eyesores nearly everywhere you look. 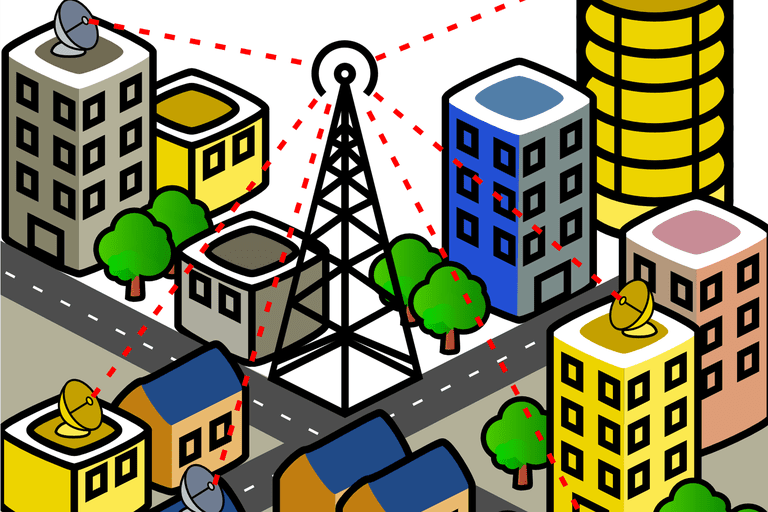 For 5G to really shine in a highly-populated city, for example, especially given its short distance limitations, towers need to exist close to wherever connected devices will need access to them, like at intersections, outside the doors of businesses, all around college campuses, right down your street, etc. Another reason 5G towers have to be installed so frequently in busy areas is because for the small cell to support superfast speeds, it has to have a direct line of sight with the receiving device, like your phone or home. If you ever plan to replace your home broadband internet with 5G, you'll most likely have a 5G cell tower down the street from your house. As 5G rolls out over 2019 and 2020, carriers will begin rolling out 5G coverage maps but probably won't show exactly where every tower is placed.